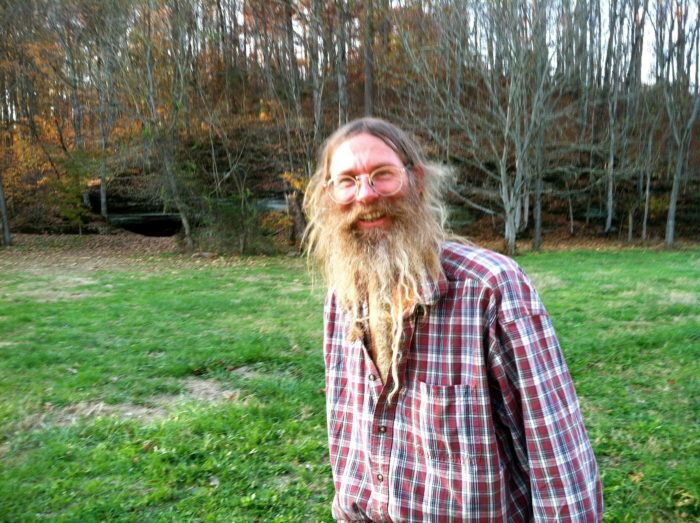 Jeff Poppen is an organic farmer based about an hour and a half north of Nashville in Red Boiling Springs, Tennessee. You may recognize him from his Barefoot Farmer segment on NPT’s Volunteer Gardener show or you may have even seen him speak around town. His expertise lies in biodynamic farming, a holistic take on organic farming that focuses on the interconnected relationship of soil, plant, and ruminant life. Jeff’s Long Hungry Creek Farm is a fairly successful operation. Among other things, they host their own CSA program, supply produce to the Husk restaurant in Nashville, and provide consultations for other farms in the area. While Jeff could have grown his farm into a larger, more profitable model long ago, he chose instead to stick with what he had, what worked, and to focus his attention on spreading his knowledge of biodynamic farming and encouraging more people to grow their own food. As part of that ongoing mission, Jeff and company are hosting their Fall Equinox Music Festival and Family Campout next weekend. It’s a four day happening at his farm with live music, a ten mile bike ride, group yoga, workshops, community soup, and pretty much anything else you could need for a one-weekend Head Heaven out in the country. Jeff was kind enough to talk to us about the festival and his farm, and the conversation went everywhere from the Grateful Dead and Rudolf Steiner to fall gardening and the “nebulous concept of freedom” that drove him to start farming forty years ago. Read the full interview after the jump. In your late teens, you took what would have been your college fund and started the farm with your brother. Is that right? That would have been 1974. When I was 18, I moved to my brother’s farm, and a couple years later, my dad was going to give my brother $8,000 to go to college. At that time I could buy half my brother’s farm for $8,000, so we just worked out a deal. Was that the beginning of Long Hungry Creek Farm where you are now? Yeah, that was sort of the beginning. The name of the creek is Long Hungry, and at that point I decided to have an organic farm. Your dad was a professor but became a farmer, correct? Yeah. He kind of got fed up with academia. So you grew up around agriculture, but plenty of folks, especially at that time, grew up on some kind of farm and went on to become accountants and salespeople, anything else. What made you decide as a young man that you wanted to stay in that world, and going further, what pushed you towards biodynamic farming? Probably a nebulous concept of freedom and a dissatisfaction with the system and the status quo, particularly wars, energy policy, social injustice. These were all big themes in my family. I guess they were kind of liberal or whatever. And there was the Vietnam War going on. It was just a lot of really negative things, and on the other hand, you could live on a farm and grow your own food and make your own energy and have fun with your friends and play Grateful Dead songs all day long and it was a blast! So I just didn’t see any reason to do any different. I’m glad that you mention the times and even the Dead there. Did music play a role in your adolescence? Anyway, I got a guitar soon thereafter and really enjoyed music on the radio and all that. Then my brother came back from California with a great record collection in 1968, so I got to hear a lot of bands that were going on in California. What was he doing in California? Going into what you said about the Vietnam War and everything else, coming of age in such a polarizing, politically charged time, were there any key figures or movements that encouraged your decision to farm and pursue the biodynamic route as well? Well, I would say the music and that movement had within it the beginnings of something that I deduced later, what I call the hippie back-to-the-land movement came out of. But that probably didn’t happen until after people lived in the cities, went to concerts, realized they needed some food, where you get food. Food comes from what now? What was that? “Man, where does food come from?” [Laughs] And it turned into, “Maybe we should get a piece of land and grow some of that stuff!” So all of that was kind of happening at that time I guess. I was pretty young. But as far as key figures, there was… Of course musically, you get Bob Dylan and the Dead and the Stones and all that. They all had really important things to say. You know, the Beatles. Then you had your leaders in the movement. There were the Black Panthers and the SDS and Timothy Leary and Ram Dass, and the Whole Earth Catalog ran then. So those were all kind of news, and you knew something was afoot. But soon thereafter, it just kind of became apparent that we better figure it out on our own… figure out what to do. Growing food seemed like the smartest thing. My mother bought my father Rudolf Steiner’s book on agriculture, which is a biodynamic book. That fell into my hands soon thereafter, so we were both aware of it and talked about some of those principles. They made sense to my dad. Consequently I took it to heart, and it’s become a never-ending source of inspiration for me. It’s called Agriculture by Rudolf Steiner. Fast-forwarding forty years or so, tell us about the Fall Equinox Music Festival. How long have you been doing it, and how did the idea come about? Well, equinoxes and solstices have been celebrated since the beginning of history. We couldn’t go back far enough to find out when they were celebrated because they’re celestial events that are unique and obvious. Longest days of the years, shortest days of the years, and most evenest days of the years. When you don’t have a lot of other distractions, those things are very apparent. They also come at certain times of the year that a human being living on a farm, you know, you’re going through harvest in the fall or planting in the spring or hoeing and all that in the summer. All those things have different characteristics, and fall is the time where we’ve had all this sun energy, [we’re] evening out again, and we’ll soon go into more of an inward type of… looking at your soul from the inside rather than just lying around like a mad person out there in the world. So it’s the dichotomy of the human being going from the world back into himself. This is what’s happening this time of year as we get all the crops in and get some stuff planted for the fall. We just started doing it when we had our farm back forty years ago. We would just have these gatherings. Our farm was set up sort of central to a lot of friends. We had a volleyball court, and people would come over for these types of celebrations, bring a lot of food, musical instruments, things of that nature. Very informal. There was never any thought of money or anything like that for about thirty years, and then they got kind of big so we started having a gate and charging a little bit so we could have some security and electricity, things like that. That’s been going on for about ten years. But we have all celebrated those things as humans. They have Christian holidays that are similar. Christmas, Easter, St. John’s Day, and Michaelmas would be the equinoxes and solstices in that part of history. For people coming this year, what can they expect to see at the festival? Mostly just our friends. It’s just kind of a family campout with a bunch of people out here. Not many from Nashville. More like people from here out in the country that don’t want to deal with the traffic. [Laughs] So there’s just each other. There’s a real pretty creek. There’ll be some music and some bonfires and drumming. I think there’s some workshops planned. Oh, there’s a hula hooper! A famous hula hooper’s coming. Wrapping up, many people in Nashville like to keep summer gardens, but fall gardens don’t share the same popularity. I’m here to change that, and let me tell you, I have got some kale seeds! So if anybody wants some seeds, it’s really good kale. Bodes through the winter pretty good, comes up real good, and I’ve got enough seed to give away to anyone that wants it. Is the process any more difficult than during the summer? Way easier! Way easier. No bugs, no sweat, no weeds. It’s just the easiest garden to grow. Wherever you’ve had beans, squash, cucumbers, potatoes, corn, melons, anything that you’re pulling out right now, don’t ever leave it there. Get some kale and turnips, collards, bok choy, Chinese cabbages, lettuce, things like that going. The Fall Equinox Music Festival and Family Campout is at Long Hungry Creek Farm in Red Boiling Springs, TN next weekend, September 15-18. Entry is $50 for the weekend. More information can be found at the Barefoot Farmer website.